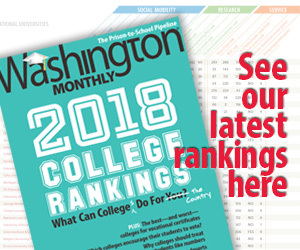 Washington Monthly | Which Colleges Encourage Their Students to Vote? Most readers of the Washington Monthly do not need any reminder to vote in next week’s midterm elections. (I voted early, and you should consider doing so if your state allows.) But college students, particularly those who are young adults, are not known for high voter turnout rates. Just 16 percent of 18-24 year olds reported voting in the 2014 midterms, compared to 59 percent of adults ages 65-74. The gap was not much smaller in the 2016 presidential elections, with just 39% of 18-24 year olds reported votingcompared to 70 percent of 65-74 year olds. It is little wonder that politicians spend a disproportionate amount of time and resources on issues important to older—instead of younger—adults. Participates in NSLVE, which allows colleges to calculate their voter registration and turnout rates. Make their NSLVE data (including voter turnout rates) publicly available. Sign up for ALL IN, which helps colleges develop action plans around civic engagement. Make their ALL IN action plans publicly available. We are pleased to present an updated and more complete list of two-year and four-year colleges that met the above four criteria. These institutions, representing a broad range of American higher education, show that civic engagement is alive and well on college campuses. We will be periodically updating this list. If You Get a Gift Card for Christmas, Use It to Buy Our New Book! 'Never Too Late' is the first book for adults who are thinking of going back to college.